Make great memories with your Father and treat him to a day of fun this Father's Day on the Father's Day Limited! Take Dad on a relaxing one hour train ride through the scenic forests of Shelby County aboard our restored historic train cars. Father's ride at ½ regular coach fare when accompanied by one or more of his children in coach class! Want to give Dad the ultimate railroading experience? Then purchase tickets to ride in the locomotive with the engineer or in the caboose with the brakeman! 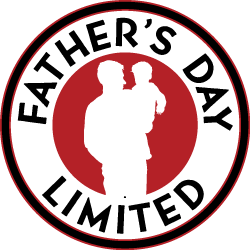 The Father's Day Limited will be an experience you'll remember with Dad for years to come! The Father's Day Limited train ride lasts approximately 1 hour. Please arrive 1 hour prior to your departure time to pick up your tickets at the Calera Depot, use the restrooms at the Gift Shop, and get in line at your boarding location. Make sure to visit the exhibits in our Depot Museum, our collection of railroad equipment in Clark Yard, our working Signal Garden, and buy your father a gift at the Gift Shop. 2 Adults 2 Children Save $8! Above prices include taxes but not convenience fee. $3.00/ticket purchased on web or $4.00/ticket if purchased through the ticket call center at 205-757-8383.